It’s time to remove the mask we hide behind and show the world who we are – Fearless! This fifth annual event will be a night to remember filled with friends, awesome music and dancing, cocktails and an exclusive auction. 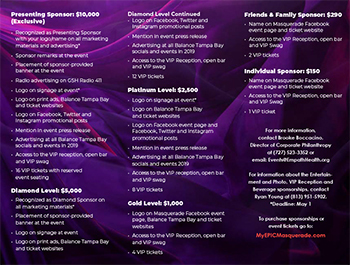 As Balance Tampa Bay’s marquee event, the Masquerade has raised more than $80,000 for EPIC (Empath Partners in Care) services and programs. EPIC is an impactful nonprofit organization working to stop new HIV infections, break the on-going stigma surrounding an HIV diagnosis and provide care and support for those infected. call Molly Robison at (727) 523-3441.